Book Description: This directory focuses on colleges, institutes, and universities in British Columbia and the way each: provides support for its community; uses, creates, and evaluates open educational resources; and engages in open education on campus through events, a working group, and student involvement. In time, it will include similar information regarding post-secondary institutions and projects across the rest of Canada. This directory focuses on colleges, institutes, and universities in British Columbia and the way each: provides support for its community; uses, creates, and evaluates open educational resources; and engages in open education on campus through events, a working group, and student involvement. In time, it will include similar information regarding post-secondary institutions and projects across the rest of Canada. This is an ongoing resource and will be updated as information comes available. A “Last update” textbox is posted at the bottom of each chapter to indicate when information was last added. Post-Secondary Directory by Lauri M. Aesoph is licensed under a Creative Commons Attribution 4.0 International License, except where otherwise noted. 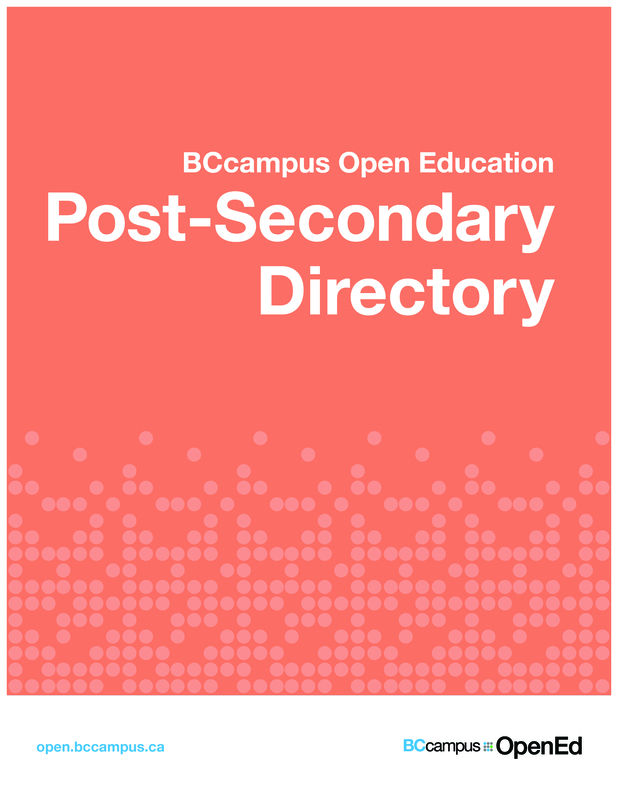 The BCcampus Open Education Post-Secondary Directory by Lauri M. Aesoph is used under a CC BY 4.0 licence. Visit BCcampus OpenEd to learn about open education in British Columbia.